Cobweb scarf is 8 feet long for maximum wrapping. Mohair along the edges gives an ethereal quality. 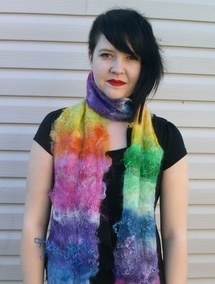 This scarf is shown in the "rainbow" colourway. The base is merino wool felted together with mohair. These scarves are only made during the summer months, so be sure to get yours early. Extra fine merino wool and silk are felted together to form the base which is used as the background for a mosaic of patterns: for example hearts, leaves, fish. Various colours. These long boa style scarves are fully fringed in hand spun yarns - combinations of wool, silk, mohair, alpaca, yak, and occasionally angelina because who doesn't like a little glitter? These hand dyed habotoi scarves are huge - 33" x 109" - suitable as an opera shawl, dance veil or an alternative to a winter wool scarf. With a single knot, they can also be turned into a sleeveless jacket for those moonlight cruises. No two are the same, triple dyed to achieve colour depth in a variety of shibori patterns.